Cisco Meraki’s cloud-based location analytics and user engagement solution provides data about visitors to physical locations, enabling businesses to better understand the behavior of clients. Location Analytics is available with all Cisco Meraki wireless access points. Location Analytics data is gathered by capturing and analyzing the beacons that every WiFi enabled device periodically emits when its WiFi antenna is turned on in order to detect the presence of nearby wireless networks. The Cisco Meraki dashboard displays anonymized and aggregated statistics on nearby devices, whether they join the network or not. Location Analytics distinguishes between devices and recognizes repeat visitors by collecting a MAC address, the unique identifier assigned to every device connecting to wired or wireless networks. Only a device's MAC address is captured, and the aggregated data provided to businesses using Location Analytics can't be traced back to an individual without the business having prior knowledge of the MAC address of that person's device. Cisco Meraki uses a one-way hash function to anonymize MAC addresses before storage. The function is irreversible; given a specific hashed MAC, there is no way to undo the function to reveal the original MAC address. In addition, bytes are dropped from the hashcode, meaning that even if one knew the hash function, they could not determine if a specific MAC had visited a location. Hashed MAC addresses are unique to each business or organization, so it is not possible to view Location Analytics data for a single device across networks with different owners. Our datacenters are protected by enterprise-class physical and network security, and are subjected to regular audits and penetration tests by independent third parties. In addition to providing statistics to businesses within the Cisco Meraki dashboard, through the Location Analytics API we export MAC addresses of probing clients, consistent with industry standards. Retail and enterprise customers can use the Location Analytics API to integrate Location Analytics data from their network with their own custom-built applications. The Location Analytics API provides no mechanism to connect MAC addresses with any other personal information. In order to leverage Location Analytics data to identify or communicate with visitors, businesses must request that data directly. We provide a set of best practices to users of the Location Analytics API, and it is their responsibility to take appropriate measures to safeguard the privacy of personally identifiable information that they may collect. If you would like to exclude your WiFi-enabled devices from Location Analytics services, you may do so through a simple opt-out form, available here https://account.meraki.com/optout. Opting out will exclude your MAC address from Location Analytics analytics in the Cisco Meraki dashboard and from export through the Location Analytics API. It is the Cisco Meraki customer’s responsibility to notify visitors that Location Analytics services are in use. Our customers’ security is a top priority for the Cisco Meraki team. We invest heavily in tools, processes, and technologies to keep our users and their networks safe, including third-party audits, features like two-factor authentication, and our out of band cloud management architecture. The Cisco Meraki vulnerability rewards program is an important component of our security strategy, encouraging external researchers to collaborate with our security team to help keep networks safe. If you are a user and have a security issue to report regarding your account (issues including password problems and account abuse issues), non-security bugs, and questions about issues with your network please contact Cisco Meraki Support. The Cisco Meraki service is colocated in tier-1 datacenters with certifications such as SAS70 type II / SSAE16 and ISO 27001. These datacenters feature state of the art physical and cyber security and highly reliable designs. All Cisco Meraki services are replicated across multiple independent datacenters, so that customer-facing services fail over rapidly in the event of a catastrophic datacenter failure. The Cisco Meraki Cloud Networking service is powered by a multi-tier data storage architecture. This architecture allows us to offer powerful capabilities such as the ability to upload and use custom floorplans, host custom splash pages, and provide in-depth Location Analytics as part of the dashboard and product experience. The Meraki storage architecture is designed to store different types of data in a highly redundant and scalable fashion. Security - Using encryption and data segmentation, we ensure data is stored securely and effectively in a multi-tenant environment. Durability - Using versioning and replication, data can be accessed for long periods of time without sacrificing performance. Availability - For high availability, all types of data are continuously duplicated and stored on two separate Meraki cloud services, providing full redundancy in the event of a datacenter failure. Scalability - By building custom databases and building out our global datacenter footprint, we are constantly pushing the limit in terms of how much data can be stored and visualized. By following these underlying principles, Meraki has created a best-in-class data storage architecture that allows for rapid data lookup, the ability for customers to upload custom assets, and highly redundant customer configuration backups. Cisco Meraki’s out of band control plane separates network management data from user data. Management data (e.g. configuration, statistics, monitoring, etc.) flows from Cisco Meraki devices (wireless access points, switches and security appliances) to the Cisco Meraki cloud over a secure Internet connection. User data (web browsing, internal applications, etc.) does not flow through the cloud, instead flowing directly to its destination on the LAN or across the WAN. What happens if my network loses connectivity to the Cisco Meraki cloud? In addition to the Cisco Meraki secure out of band architecture and hardened datacenters, Cisco Meraki offers a number of tools for administrators to maximize the security of their network deployments. Use of these tools provide optimal protection, visibility, and control over your Cisco Meraki network. 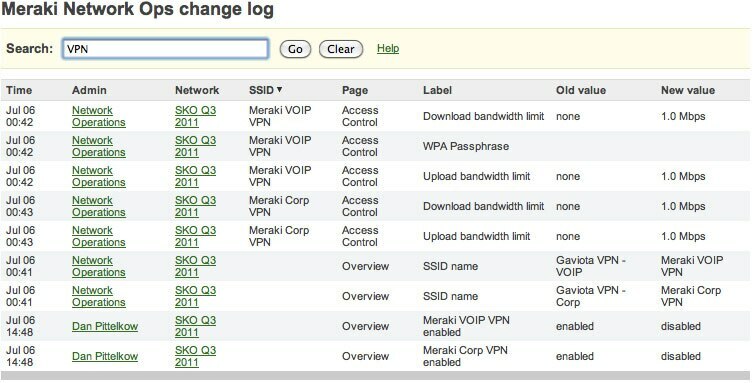 This page contains information about how to quickly and easily increase the security of your meraki.com accounts and our recommended best practices for account control and auditing. For more information, see Cisco Meraki manuals. Two-factor authentication adds an extra layer of security to an organization's network by requiring access to an administrator's phone, in addition to her username and password, in order to log in to Cisco Meraki cloud services. Cisco Meraki’s two factor authentication implementation uses secure, convenient, and cost effective SMS technology: after entering their username and password, an administrator is sent an a one-time passcode via SMS, which they must enter before authentication is complete. In the event that a hacker guesses or learns an administrator's password, she still will not be able to access the organization's account, as the hacker does not have the administrator's phone. Cisco Meraki includes two-factor authentication for all enterprise users at no additional cost. Role-based administration lets you appoint administrators for specific subsets of your organization, and specify whether they have read-only access to reports and troubleshooting tools, administer managed guest access via Cisco Meraki’s Lobby Ambassador, or can make configuration changes to the network. Role-based administration reduces the chance of accidental or malicious misconfiguration, and restricts errors to isolated parts of the network. 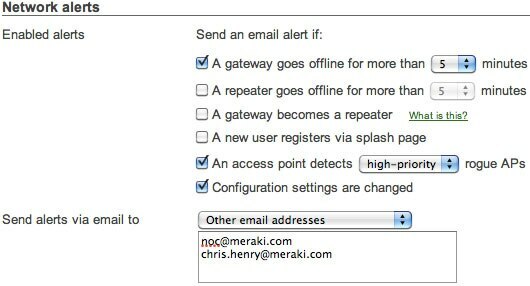 The Cisco Meraki system can automatically send human-readable email alerts when network configuration changes are made, enabling the entire IT organization to stay abreast of new policies. Change alerts are particularly important with large or distributed IT organizations. Cisco Meraki logs the time, IP, and approximate location (city, state) of logged in administrators. Additionally, Cisco Meraki provides a searchable configuration change log, which indicates what configuration changes were made, who they were made by, and which part of the organization the change occurred in. Auditing configuration and login information provides greated visibility into your network. Cisco Meraki accounts can only be accessed via https, ensuring that all communication between an administrator's browser and Cisco Meraki cloud services is encrypted. As with any secure web service, do not log in if your browser displays certificate warnings, as it may indicate a man-in-the-middle attack. Cisco Meraki provides a comprehensive solution to ensure a PCI compliant wireless environment held to the strict standards of a Level 1 PCI audit (the most rigorous audit level). Cisco Meraki’s rich security feature set addresses all of the PCI Data Security Standards, helping customers to build and maintain a secure network, protect cardholder data, maintain a vulnerability management program, implement strong access control measures, and monitor network security. Unlike traditional networks, Cisco Meraki’s intelligent security infrastructure eliminates the management complexities, manual testing, and ongoing maintenance challenges that lead to vulnerabilities. Cisco Meraki’s intuitive and cost effective security features are ideal for network administrators, while powerful and fine-grained administration tools, account protections, audits, and change management appeal to CISOs. Centrally managed from the cloud, Cisco Meraki makes it easy and cost effective to deploy, monitor, and verify PCI compliant networks across distributed networks of any size. The Cisco Meraki cloud-hosted management system is out of band, meaning that traffic (including cardholder data) does not flow through Cisco Meraki’s cloud or any other Cisco Meraki infrastructure not behind your firewall. Learn more about Meraki’s out of band architecture. Cisco Meraki datacenters are SSAE16 / SAS70 type II certified, feature robust physical and cyber security protection, and are regularly audited by third parties. Learn more about Cisco Meraki’s datacenters. Cisco Meraki wireless APs include an integrated stateful firewall which ensures that guest WiFi users and other non-privileged clients cannot access cardholder data, in conformance with Requirement 1.2.3. The firewall’s LAN isolation feature enables one-click secure guest WiFi, wherein guests can only access the Internet. Blocked from LAN access, guests cannot spread viruses or reach internal resources. Cisco Meraki’s firewall provides fine-grained control, from layer 3 through 7. Configure VLAN tags, ACLs, identity-based policies, and block unwanted applications — even peer-to-peer apps without well-known hosts and ports. Cisco Meraki does not ship with default vendor keys that need to be changed. Cisco Meraki hardware is configurable through an SSL-encrypted connection, accessible only by authenticated users. To comlpy with Requirement 2.1.1, simply enable strong security standards, such as WPA2 (802.11i). See Requirement 4.1.1 for more information on wireless encryption. Cisco Meraki firmware updates are delivered seamlessly from the cloud to APs, security appliances, and switches. When firmware updates are available, an administrator simply schedules an appropriate time for Cisco Meraki devices to download and install the new version, eliminating insecure and out of date firmware in the Cardholder Data Environment. This delivery model facilitates compliance with Requirement 6.1 – without deciphering compatibility matrices, time consuming manual updates, site visits to branch locations. Cisco Meraki provides role-based administration to enforce the principle of least privilege in compliance with Requirement 7.2. Role-based administration lets you appoint administrators for specific subsets of your organization and specify whether they have read-only access to reports and troubleshooting tools, can administer managed wireless guest access via Cisco Meraki’s Lobby Ambassador, or can make configuration changes to the network. Cisco Meraki includes a comprehensive suite of features to enable unique ID and authentication methods for network administration, in compliance with Requirement 8. Configure organization-wide security policies for your Cisco Meraki administrator accounts to better protect access to the Cisco Meraki dashboard and network infrastructure. These policies include account protections such as two-factor authentication, password hardening policies, and the use of encrypted transmission (SSL/TLS) for access to the Cisco Meraki dashboard. Cisco Meraki logs the time, IP, and approximate location (city, state) of logged in administrators. Additionally, Cisco Meraki provides a searchable configuration change log, which indicates what configuration changes were made, who they were made by, and which part of the organization the change occurred in. Auditing this configuration and access information satisfies Requirement 10 and provides greater visibility into your network. Cisco Meraki datacenters undergo thorough quarterly scans and daily penetration testing by Qualys, an Approved Scanning Vendor (ASV). Cisco Meraki is verified to be free of vulnerabilities such as injection flaws, cross-site scripting, misconfiguration, and insecure session management. Cisco Meraki datacenters are SSAE16 / SAS70 type II certified and hardened against physical and network intrustion. These procedures exceed the scanning and penetration testing requirements of requirement 11.2 and 11.3, respectively. Cisco Meraki’s out-of-the-box WIDS/WIPS, Air Marshal, protects the network from unauthorized wireless access points that may compromise network security. Rogue APs are unauthorized wireless APs that connect to your wired LAN, or that connect to a separate network but masquerade as part of your WLAN, using your same SSID. Cisco Meraki automatically detects rogue APs, identifying their IP address, VLAN, manufacturer, and model, and optionally contains them to neutralize their threat. Air Marshal includes network-wide visualization, email alerts, and reporting, meeting Requirements 11.1 and 11.4. For more information about Cisco Meraki security capabilities, PCI compliance, and configuration best practices, please contact a Cisco Meraki specialist. Cisco Meraki is committed to data protection, privacy, security, and compliance with applicable regulatory frameworks in the US and abroad. The Meraki cloud-based architecture is designed from the ground up with data protection, privacy, and security in mind. EU Cloud—Networks configured to operate in the EU Cloud ensure that even the network management information is stored in the European Economic Area (EEA), including failover and back-up. With best practices implemented, customers can limit the transfer of personal data outside the EEA. Data Processing Addendum (DPA)—Cisco Meraki makes available to its customers a DPA that incorporates the European Commission’s Standard Contractual Clauses (also known as the EU Model Clauses) so that customers may allow transfer and processing of personal data outside the EEA in accordance with applicable European privacy and data protection regulations and local laws, including the General Data Protection Regulation (GDPR) that went into effect in May of 2018. Privacy Shield—Both Meraki LLC, and its parent company Cisco Systems, Inc., have certified their compliance with the EU-U.S. and Swiss-US Privacy Shield Frameworks and Principles set out by the US Department of Commerce for the collection, use, and retention of personal data transferred from the EU and Switzerland. Meraki and Cisco process personal data they receive, including in the case of onward transfers of personal data from the EU and Switzerland, in accordance with those Principles, ensuring an adequate level of protection under applicable European privacy and data protection regulations. Binding Corporate Rules—Cisco's data protection and privacy policies, standards, and related documentation ("BCR-C") have been approved by the European data protection supervisory authorities. This approval demonstrates that Cisco's Data Protection & Privacy program is aligned with EU requirements, including GDPR. Cisco's BCR-C sets forth the mandatory, minimum standards for handling EU personal data by Cisco, as a data controller. BCR-C approval serves as a legally valid transfer mechanism and commits Cisco to processing EU personal data in accordance with EU data protection standards anywhere in the world that Cisco operates. As a wholly owned subsidiary of Cisco, Meraki is also covered under Cisco's BCR-C.
GDPR—The European Union General Data Protection Regulation (GDPR) brings long-anticipated consistency to the data protection landscape in Europe. GDPR embodies the well-recognized privacy principles of transparency, fairness, and accountability. Cisco Meraki is committed to helping our customers and partners by protecting and respecting personal data, no matter where it comes from or where it flows. Read more about what Meraki has done to ready ourselves and our customers for the GDPR. Further information on the DPA and the safeguards we employ with respect to data transfers from the EEA can be found in our FAQ. The FAQ is also available in German. Meraki may from time to time partner with third party service providers who contract to provide the same level of data protection and information security that customers can expect from Meraki. Some of these third parties are engaged as “subprocessors” to process customer data, including limited personal data, in connection with providing you Meraki products, including Dashboard. A list of subprocessors currently engaged by Meraki to provide our products is set out below. Meraki may update this list from time to time. This page is provided for informational purposes only. This Service Level Agreement (this “Agreement”) sets forth Meraki’s obligations and our customers’ rights with respect to the performance of Meraki’s Hosted Software. All capitalized terms used but not otherwise defined in this Agreement have the meanings given to them in the End Customer Agreement or the Supplemental End User License Agreement between you (the “Customer”) and Meraki (in either case, the “Customer Agreement”). The standard terms of the End Customer Agreement are available at meraki.com/support/#policies, and the standard terms of the Supplemental End User License Agreement are available at www.cisco.com/go/terms. “Downtime” means if the Hosted Software is unavailable to Customer due to failure(s) in the Hardware, Firmware, or Hosted Software, as confirmed by both Customer and Cisco Meraki. “Service Credit” means the number of days that Cisco Meraki will add to the end of the Term, at no charge to Customer. 3. Customer Must Request Service Credit. In order to receive any of the Service Credits described above, Customer must notify Cisco Meraki within 30 days from the time Customer becomes eligible to receive a Service Credit. Failure to comply with this requirement will forfeit Customer’s right to receive a Service Credit. 4. Maximum Service Credit. The aggregate maximum amount of Service Credit to be issued by Cisco Meraki to Customer for all Downtime that occurs in a single calendar month will not exceed 15 days. Service Credit may not be exchanged for, or converted into, monetary amounts. 5. Exclusions. The Service Level Warranty does not apply to any services that expressly exclude this Service Level Warranty (as stated in the documentation for such services) or any performance issues (i) caused by strikes (other than strikes of a party’s own employees), shortages, riots, insurrection, fires, flood, storm, explosions, acts of God, war, governmental action, labor conditions (other than with respect to a party’s own employees), earthquakes, material shortages or any other causes that are beyond the reasonable control of a party so long as the parties use commercially reasonable efforts, including the implementation of business continuity measures, to mitigate the effects of such force majeure., (ii) that resulted from Customer’s equipment or third party equipment, or both (not within the primary control of Meraki), or (iii) that otherwise resulted from Customer’s violation of the restrictions or Customer responsibilities set forth in the Customer Agreement. 6. Exclusive Remedy. This Agreement states Customer’s sole and exclusive remedy for any failure by Cisco Meraki to meet the Service Level Warranty. Policies and Standards: further development of standards and processes to define the personal data lifecycle and help ensure data transparency, accuracy, accessibility, completeness, security, and consistency across the Cisco Meraki platform. Data Inventory and Mapping: completion of an assessment of the Cisco Meraki product architecture known as a data protection impact assessment (DPIA). Incident Response: ongoing review and update of Cisco Meraki’s incident response process, including improved coordination with cross-functional teams from the Privacy, Security, Legal, Engineering and Product groups at Cisco Meraki and its parent company, Cisco Systems, Inc.
Data Transfer Mechanisms: certification to the EU-U.S. and Swiss-US Privacy Shield Frameworks and Principles set out by the US Department of Commerce for the collection, use, processing and cross-border transfer of personal data from the EU and Switzerland to the US (current); under the leadership of Cisco Systems, Inc, approval of Binding Corporate Rules-C (complete); update of the Cisco Meraki Data Processing Addendum incorporating the European Commission’s Standard Contractual Clauses (SCC) to ensure alignment with GDPR requirements (available here). Third Party Audit and Certifications: maintenance of the Cisco Meraki Dashboard Payment Card Industry (PCI) Level 1 certification and data center certifications, such as SAS70 type II / SSAE16 and ISO 27001. Privacy by Design: continued integration of data protection, privacy, and security principles into product design and development processes at all stages of the product development lifecycle. Data Protection and Privacy Awareness for Employees: continued employee training and awareness regarding data protection and privacy through company-wide interactive campaigns, training courses, external certifications and online collaboration and communication resources. Dashboard Feature Development: development of new Dashboard features to help enable Cisco Meraki customers, as Data Controllers, to respond to data subject requests under GDPR. Such features will be available via Dashboard without any additional cost to customers with valid software licenses in place. Greater Territorial Reach: GDPR applies to Data Controllers and Data Processors that are established in the EU or that, regardless of location, collect and/or process personal data of data subjects present in the EU. Material Fines: Data Controllers and Data Processors may face maximum fines under GDPR for egregious mishandling of personal data ranging from 2% to 4% of their annual global revenue. One-Stop Shop Structure: companies subject to GDPR are accountable to the data protection authority (DPA) of the country of their main establishment in the EU (in cooperation with other relevant DPAs). As Cisco Meraki’s parent company, Cisco Systems, Inc., has established EU headquarters in Amsterdam, Cisco Meraki's "main establishment" is the Netherlands and the Dutch DPA is Cisco Meraki's lead authority. Data Portability: depending on the product or service and data involved, data subjects may have a right to request data that they supplied to Data Controllers be given to them in commonly used electronic format. Consent: consent by data subjects to collection and processing of personal data must be fully informed, freely given and revocable at any time. In addition, the sale of goods or services cannot be contingent on consent. Right to Erasure: data subjects have the right to request deletion of their data where there are no legitimate grounds for retaining it. Increased Company Accountability Data Protection Impact Assessments: companies that collect and process high risk data sets will be required to conduct (and document) a data protection impact assessment (DPIA). The DPIA evaluates the potential risk and impact personal data processing activities may have on the data subject’s fundamental rights and freedoms and informs how to appropriately manage that risk. Privacy by Design/Default: privacy issues must be considered and addressed at the design phase of products, and privacy driven functionality must be designed into data driven technology. To the extent privacy options are available, the default setting should be the more privacy protective option. Breach Notification: GDPR requires Data Controllers to notify relevant Data Protection Authorities (DPAs) within 72 hours of becoming aware of a personal data breach, unless the breach is unlikely to result in a risk to the rights and freedoms of impacted data subjects. Data Controllers must also notify impacted data subjects without undue delay when a high risk to rights and freedoms is likely. Data Processors must notify Data Controllers of a data breach without undue delay. Data Processor and Data Controller Liability: GDPR imposes new liability and accountability obligations directly on Data Processors. In addition, Data Controllers will be liable for the misconduct of the Data Processors they select, unless they can prove that they were not in any way at fault under GDPR. Data Protection Officer (DPO): companies should (and in some cases may be required to) appoint a Data Protection Officer (DPO) and a team that is accountable for data protection efforts and activities. The information provided on this page is for informational purposes only.